media last Friday after the inquest into his wife’s death concluded. The inquest into the death of Savita Halappanavar did not blame anyone for her death. Despite all we have heard over the past two weeks, no one is to be held accountable. Even the hospital is not to be blamed, despite the admission of the consultant (senior doctor) involved in Savita's care that her death was due to a "systems failure" in her treatment in hospital (mainly due to poor communication and mistakes). Instead the main finding of the inquest is that Savita died of "medical misadventure." It's an antiquated term, like much of the law and the terminology relating to inquests. In plain man's language it's like saying that something was an accident, a happening for which no one is responsible. It even carries the suggestion of an element of bad luck. Misadventure -- a sort of accident due to bad luck. It's an interesting legal term. It's also a totally inadequate term to describe the appalling combination of Catholic-inspired law, medical incompetence, mistakes by hospital staff, inadequate record keeping, poor communication and failure to care that resulted in Savita's death. But it would be a mistake to blame the coroner who conducted the hearings for the unsatisfactory nature of the main finding of the inquest. An inquest in not a criminal court. It is confined by legislation to establishing the cause of a death. That is its sole function, and it is specifically excluded from finding anyone guilty or even of apportioning blame. In this case there is general agreement that the coroner did an excellent job in making public for the first time the circumstances and the causes of Savita's death. It may not be the complete picture, given the limitations of a coroner's court and fact that one key witness did not give evidence. But it has given us a great deal of detail about what happened, detail that has shocked the country and punched a large hole in the credibility of our claims about having one of the best maternity hospital systems in the world. What emerged during the six days of the inquest over the past two weeks was really frightening. A tragedy of errors, Savita's care was a shameful sequence of failure to diagnose what was happening to her, of poor or inadequate treatment, of sloppy medical records and failure to read notes, of failure to communicate between staff, of delayed testing and so on. Above all, it exposed the refusal of the hospital to allow her a termination until it was too late. It started right at the beginning. She went to the hospital on the Sunday in pain, probably in the early stages of miscarriage, but this was not diagnosed and she was sent home again. In more severe pain, she returned a few hours later, was admitted and was found to be miscarrying. It was established that her membranes had ruptured (leaving her open to infection) and that there was very little chance of the baby surviving (she was 17 weeks pregnant). Still in pain and instinctively feeling that she was not well, on Monday and Tuesday she asked for a termination. Her consultant explained that the law prohibited a termination because there was still a fetal heartbeat present. A midwife explained that this was because "Ireland is a Catholic country," the remark that made news around the world. There were failures to notice changes in her blood cell counts, indicating sepsis (blood poisoning). Incredibly, when she began to shiver violently (a clear indication of the onset of blood poisoning) she was given a paracetamol pain tablet and a blanket. By the time she was diagnosed, on the Wednesday, the sepsis was already advanced. Her consultant, who had delayed a termination because she was awaiting the fetal heartbeat to stop and for the results of a blood test that had gone astray, finally agreed to intervene. Savita was taken to surgery but she delivered spontaneously and the fetus was already dead. But by then it was too late. She was in septic shock, her organs had begun to fail and intensive care failed to save her. Some of the details of the story were truly shocking, particularly the symptoms that were missed by nurses, doctors and the consultant, for example the falling blood-pressure readings that the nurses saw and noted but did not communicate to a doctor, the inadequate antibiotics Savita was given even when it was realized she was seriously ill, the failure of one doctor to tell the consultant about a discharge that would have prompted earlier intervention, and so on. Most shocking of all, of course, was the refusal to give Savita the termination she requested. That is the fundamental point in all of this. Aware that her fetus would not survive, in pain and sensing that her body was not feeling right, Savita requested a termination. If she had been granted a woman's right to choose, this one fact transcends all the arguments. If she had been allowed to choose, she would be alive today. You will be aware that the legal situation here on abortion depends on a Supreme Court decision in the 1980s (after the X-case) which upheld the equal right to life of the mother and the unborn, but said that abortion is permissible when there is "a real and substantial risk to the life" of a woman instead of just to her health. The Supreme Court implied that it was up to the Dail (Parliament) to legislate for the detail of this, but our gutless politicians never did. The Irish Medical Council issued guidelines for doctors, but these did not go much further than the Supreme Court phrase about "a real and substantial risk" to the life of the woman. Basically individual doctors were left by themselves to interpret what this meant in day-to-day situations. And since the vast majority of Irish women who want an abortion go to the U.K. to get one (at least 4,000 a year) this was not a huge problem. Except in crisis situations. In these situations, the fact that we do not have abortion in Ireland can be deadly, as we have seen in the case of Savita. The present government has promised to take action. Proposed legislation is supposed to come before the Cabinet this week. But there are already signs of deep divisions between and within the coalition parties on the issue. 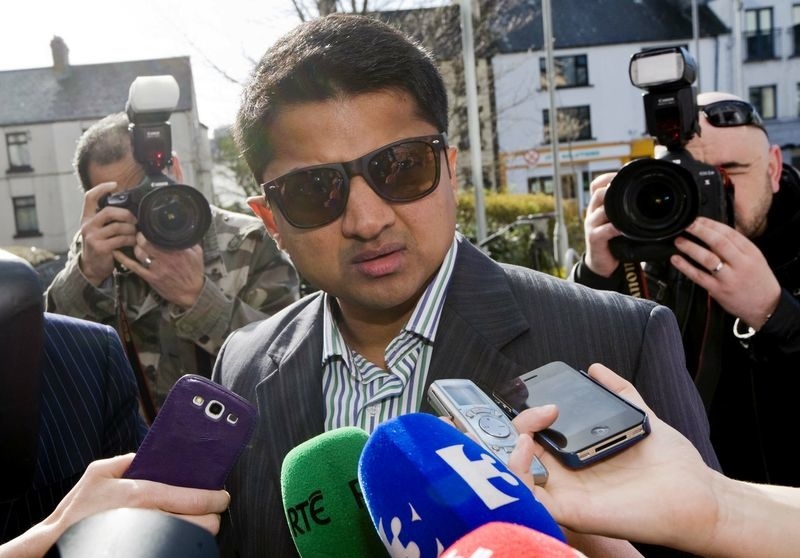 The Savita case may yet change Ireland. But it unlikely to change it very much. All the signs are that when (or if) we do get abortion here it is likely to be extremely restrictive. Whether it will prevent another Savita happening remains to be seen. The most senior doctor to give evidence at the inquest, the head of one of the biggest maternity hospitals in the country, said that under the present legal framework Savita could not be given a termination on the Monday and Tuesday. By the time she could be given one, on the Wednesday, it was too late to save her because the sepsis was too advanced. It's the deadly Catch-22 of Irish abortion legislation. How do you measure what is a "substantial" risk. How serious does it have to be before it qualifies as substantial? And how much right has a woman to decide how much risk she wants to take? In Ireland, a woman has no such right. She has to lie there while the legal framework inspired by a lot of Catholic celibate males takes its course. As Praveen, Savita's husband, said after the inquest, if she had known how rigid our system is she would have jumped out of bed and run from the hospital.